On August 8th, I was returning an hour later than scheduled from Helsinki, after the Northern Europe camp, arriving at 9:30 am. Dojocho Hiroaki was supposed to leave the same day at 11am for the Hungary and England camps. I had been away for 15 days, so I hurried for the exit gate. Hiroaki was there to meet me saying "I was worried..." and I explained "The plane left an hour late. Right now I need to reserve a bus ticket to Tokorozawa and call your mother." Hiroaki reported that "there were no problems while you were away and there's nothing especially pressing. I have to hurry to Terminal 1." So I said, "Okay, be careful. Say hello to everyone. Europe was especially hot." That's all we said to each other after a half a month away. I only had 15 minutes to line up for a ticket and take a bathroom break; there wasn't any time for chit chat. It was almost the kind of father-son talk you have when kids are in their rebellious stage, I thought chuckling to myself. 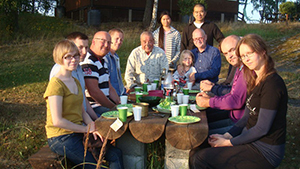 The Finnish camp was held about an hour and a half drive from Helsinki, in the old capital city of Turku, on the Baltic. We stayed in a cabin that belonged to 6th Dan Pettali’s father. It was in the forest and lake country and once in awhile, a boat might pass on the lake, but otherwise, was a quiet place to relax. 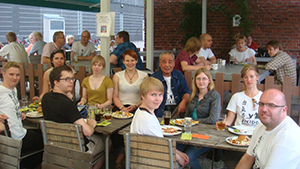 the next night, about ten members of the Turku Aikikai gathered for dinner and party, including 6th Dan Kari, who was with his grandson. I heard he wasn't feeling well. Apparently, he returned from a seminar a month before to find his wife had moved out and taken all the household goods. I ruefully smiled to myself because I had had the same experience. It seems like no matter where you go, things are pretty much the same. It was more than 20 years ago. I returned home from an Aikido demonstration to notice the house was completely dark. I entered to find a note on the table saying my wife had left, explaining "I can't live with you because.....reason 1, 2, 3, 4, 5, 6, 7.....I would like a reply that you (will change) and please sign and seal it with your official seal." I hung in there for about a week, and finally I sent her a letter all properly empresses with my seal. After that incident, even today, if something comes up, she whips out that signed and sealed letter and holds it up triumphantly. I bow my head and wait, knowing its useless to resist. I do the laundry and clean and take turns with the neighborhood fire and garbage duties. I consider it important to keep good relations with my wife which is in tune with Aikido's "wa" or harmony. Last year's summer camp in Turku was held from July 31st-August 2nd; Kari and I shared teaching responsibilities, him doing morning classes and me in the afternoon. the dojo was set up in a 3-story shipping factory where 200 mats were laid out. John, a shodan from Tokorozawa, was there practicing hard. The factory windows couldn't be opened, so it grew quite hot, with everyone taking frequent water breaks. August 3rd (Saturday) and the 4th (Sunday), saw more than 100 more people join in. On Sunday, we held an hour-long demonstration which can apparently be viewed on U Tube. On the 5th, I took the overnight ferry to Stockholm, arriving at 6am. The hotel wasn't open until 3, so Urban shihan and I hung out at his house. Stockholm is built on a series of islands. Sweden stayed neutral during World War II, so doesn't have any ruins of war. 17th and 18th century buildings remain just as they were. the dojo is right downtown and within easy walking distance of some of these buildings. 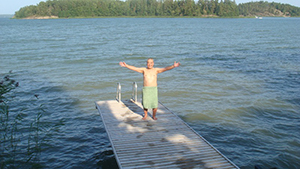 On August 6th, there was no practice, so Urban shihan, friends and I took a tour boat around the islands. We sat on the boat and leisurely drunk beer while enjoying the view. 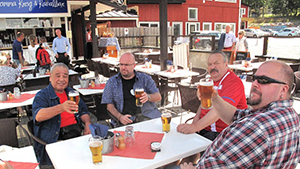 About 2:30, we arrived at our destination island and had lunch and drank beer, wine and whiskey. Everyone drank a lot, chatted and ate a great lunch. We returned about five. it was a wonderful day of eating, drinking and visiting. Two years ago, a professional magician named Martin from Sweden, put on a show for us at Kobayashi Dojos annual New Year party. he told us an interesting story. he said that magicians had been invited to Japan to visit the Tohoku region that had been devastated by the earthquake and tsunami. When he was in Tohoku, he went into a bar, met and chatted with two or three young guys. he next day, he went looking for the Aikido dojo in that town. In the Stockholm Iyasaka Dojo, students wear hakama from 2kyu, which he was. In keeping with that custom, he wore his hakama and lined up with the other students, including the young guys he had met the night before. Since Martin is such a big guy, he is 190 cm tall and weighs 130 kg, the Sensei thought he was quite advanced and asked him to teach. Since he's a professional magician and used to fooling people, he agreed and taught the class. We all had a good, long laugh. Please look at the poster for this camp. usually on these kinds of poster are photos of Sensei's throwing someone, but on this poster was a photo of me taking ukemi from a girl student probably at Meiji University. When I teach, I throw and then I'm thrown and think this is important to the spirit of Aikido. It is said that being thrown is half the practice. So everyone--let's take ukemi! In Iyasaka dojo, people from many different countries from all over Europe gathered. It felt just like our home dojo in Kodaira. I'm grateful for this. 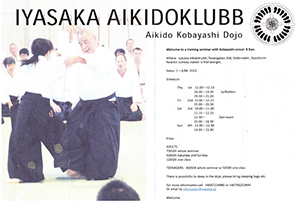 If you ever have the opportunity, by all means enjoy a visit to Stockholm and Iyasaka Dojo.